Well here’s to positive attitude – no matter if it is somewhat misguided. 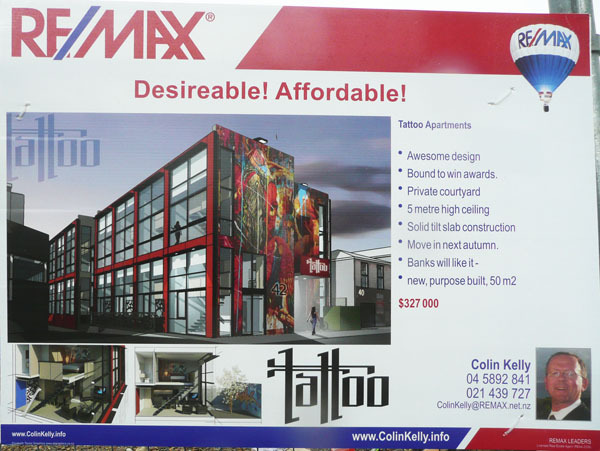 Tattoo Studios, the dinky, tiny little boxes going up in Wigan / Abel Smith St, are proceeding at an alarmingly fast pace. One week there was nothing, the next… well, there’s a whole load of concrete planks standing in the air there. Blink again and there’ll be some apartments before too long! 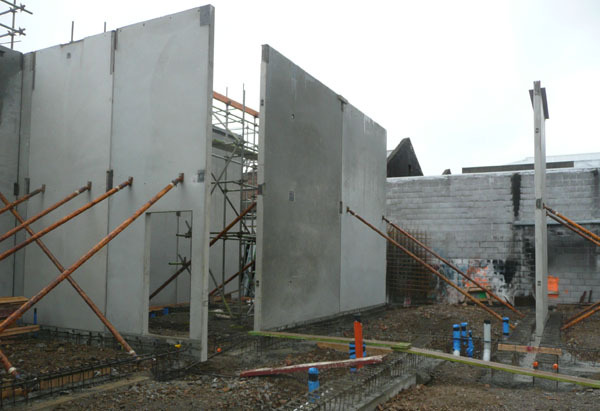 It’s an interesting process to watch – not unlike a pack of cards (albeit not in cardboard, but in concrete) with the precast panels propped, then “glued” together (actually, welded via a small inset plate) and then more cardboard concrete planks placed on top for the next floor. As long as the glue jointing is strong enough, it won’t come down like a pack of cards – in fact, once it has been all connected together, it will be as strong as a box of strong things. And that’s strong. But wait – what’s this? A sign board caught my fish eye – with a few Outrageous Comments inscribed upon it. “Banks will like it.” I presume they’ve talked to them about the tiny size – wasn’t there something about banks not loaning money on projects less than 60 m2 ? And yet, these are only 50 m2 – if you measure them while squinting… This is a big move for the market – getting things underway again. There’s also the Te Aro Towers who have started on site nearby, and even Il Casino appears to be showing signs of creeping back into life. The real question here is not whether or not banks will like it – evidently they must be prepared to loan money on them – but how well they sell, and how much people like living in a small concrete box. We’ve talked about this development before – refer here for previous comments. A curious claim of a 5m high ceiling makes it sound quite good – but then again, this is only in a tiny little portion near the front window. The rest of it will be – ooh, at a guess, a smidgeon over 2.4m legal minimum? Not really sure that claims of 5m high ceilings should be made, although that is bound to be the Estate agent, rather than the architect. There have been interesting things going on in the Estate agent world – since the Act was revised a year or so ago, there have been numerous – really, quite a lot – of complaints about various agents. To the point that the licensing board is getting a bit swamped. But I’m sure that the Agents involved here are all fine and dandy – nothing to worry about. And another claim – “Bound to win awards.” Really? A memorial award perhaps, for an exaggerating Estate Agent? Although, at least he has spelt awesome right… Bound to, eh? That has got me thinking. And awards plural too – more than one? Maybe a handful? I’m really not sure what awards that the Estate agent is thinking it will win. A national design award? I’m not sure about that. A World Architecture Festival award? Almost definitely not. A concrete award, perhaps, as that is the only material that has been used so far. Or an award for innovative compactness? Because it certainly is that – in a good way, I think. Yes, they’re tiny, but with all that concrete, at least they will be a bit sound proof, and certainly won’t rot if they leak ! Your suggestions please, for what awards you think the Tattoo project should be entered in to win! I think someone was in a hurry when they did those bullet points. “Banks will like it – ” Notice there’s a dash at the end, I think they might of deleted the end of that sentence.. Some of the bullets have full stops at the end, some don’t. One doesn’t have a capital letter at the start. Geez, I think I should of done these. This sign is a bit like my car’s marketing blurb that says its fuel economy is 4.7litres/100km. It would be, if I drove at 100km/hr everywhere, never accelerated, didn’t turn corners, or brake, carried nothing in the boot and never used the air con. 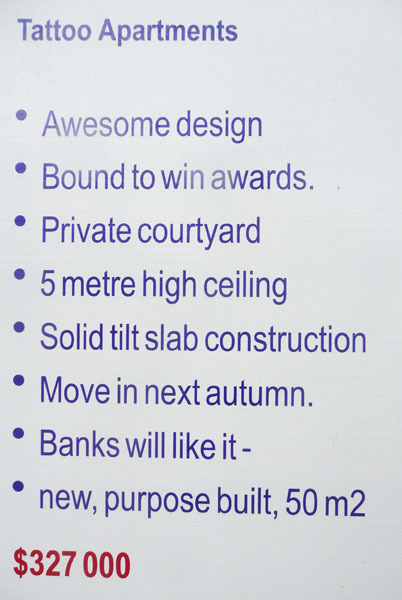 Anyone silly enough to be impressed by this sign with its typos and half-truths deserves to live in a small concrete box with a 2.4m ceiling. Best blank concrete canvas waiting to be tagged goes to…. oops, no, someone has beaten me to it. Covered already. Sav – sorry for being too pedantic but you should look at your own grammar before you scrutinize other people’s punctuation. There is no such grammatical construct as “they might of” or “I should of”. Gosh, you guys are picky! OK – I’m going to play devils advocate here, and say I like it. Wouldn’t want to buy there, that’s true, as it is far too small – but I’ve lived in smaller. Not that that is a good thing. My guess is that most of these would get rented out, rather than lived in by owner occupiers. There are some important points to note here. The first is that it is so close to the edge of the street – in fact, right on it. That little dog-leg in Wigan St has always been a tight fit for cars and trucks turning in – I’m surprised that the Council even let it be built so close to the edge – there is no footpath provided there – and I’d fully expect the odd truck scrape along the front of the precast panels before too long. But it also means that people’s living rooms are going to be right at eye level, as they’re on the street. That’ll mean that people will either live with everyone ogling them in their lounge, or that they will just draw their curtains and remain closeted inside their concrete box. The curtains option would be incredibly boring – so I hope that the buyers are all extroverts, who won’t mind us having a quick sideways peek. I see that the 3d shows roller blinds coming all the way down from the top – which may be the intention, but would be a disaster. If you’re stuck in one of these boxes, the last thing you would want to do is to block out all the sun. Perhaps they should look at having roller blinds coming up from the bottom (easy to do – just reverse it, and put in a tensioned spring on guide wires) or even different roller blinds at different heights – ie one at the top, one in the middle, one just down the bottom. I like the way they’ve got a tarty looking woman waiting outside the door and another silhouetted in the window – which hints at its possible future use – but I am also intrigued by the graphics splattered over the outside, and the inside wall of the courtyard – nice to see promotion of graffiti art and accepting the inevitable in that part of town. Also with such a big tree! That must be on the other side of the building – no room for 5m high trees that I can see in the construction so far. Overall though – does it really fit in with the surroundings? The two little Havana dwellings are now almost all that is left of the old slum dwellings, and now look so cute with their pitched roofs – poverty chic updated for the 21st century. This block will, sadly, fit in well with the blocky Wigan St building for the Design School opposite. Keep in mind that estate agents are the sort of people mendacious enough to describe a jail cell as “compact, secure living”. They open their mouths, more lies pile up in the world. Interesting development on this project over the weekend: a load of 2-story high panels have arrived and been craned into place, down the end of the project. Much road closure and cranage. I’ll send you a photo if you like. These apartments would be difficult for two people to live in as there would be no sound seperation between the bedroom and the living area. You couldn’t have one person sleeping while the other was watching tv.